Texas Toast is an easy addition to your homemade Italian dinner, but the process behind the bread is not so simple. Joseph Campione, Inc. is a leader in producing Italian breads, toasts and rolls and relies on hard-working conveyors to keep their production line moving efficiently. 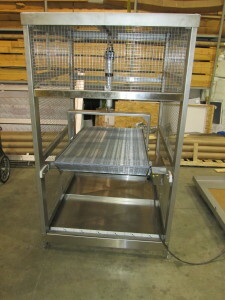 The company teamed up with Eaglestone over the past year to find a better solution to their production line needs. Campione first came to Eaglestone due to issues with an existing conveyor on their bread line. The old conveyor had a bad motor and belt tracking system, which caused substantial downtime for repairs and an overall slower production rate. For Campione’s new bakery, Eaglestone was tasked with a mission to design, engineer and build the most efficient line for their needs. We worked with Campione and its other vendors to spec out the right equipment and conveyor systems within their new 120,000 square foot facility. We provided accurate 3D CAD drawings of the line, demonstrating where it would be installed within 1/8 of an inch. 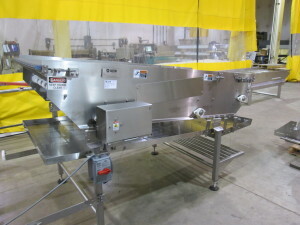 The final installation was a complete production line that works seamlessly from beginning to end with a “freeway” of transfer and multiple switch conveyors that move product from the oven and spiral cooler to multiple switches that feed topping applicators, freezers and ultimately feed an automated packaging system. Campione recognizes that Eaglestone was instrumental in putting this production line together from start to finish. Sal Campione, Vice President of Operations for Joseph Campione, Inc., expressed his complete satisfaction with their new line and the experience with Eaglestone. From design to vendor management and even assistance with the install, he praised the full service treatment he received from the Eaglestone team as well as the durability of the conveyors.